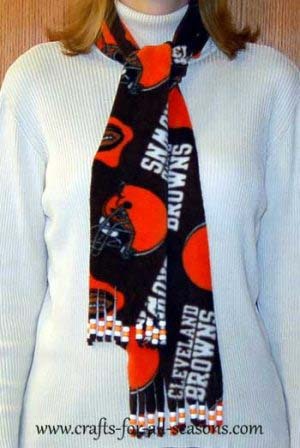 This no sew fleece scarf is a super easy craft to make this winter, and they make wonderful gifts. The wonderful thing about fleece is it comes in so many different patterns. 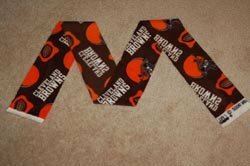 You can find a pattern and color to match your favorite coat, make one for a child with their favorite cartoon character, or make one for your boyfriend with his favorite sports team logo. You only need 1/4 yard to make one scarf, so this is also very inexpensive, especially if you wait for fleece to be on sale at your local fabric shop! 1. You may want to consider buying 1/2 yard of fleece at the fabric store, so you will have enough to make two scarves. 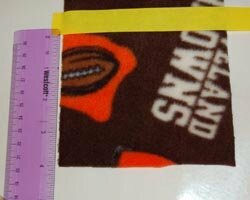 If you do this, measure off 1/4 of a yard (about 9 inches) and cut the fleece length wise. 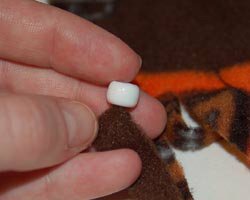 The fleece on the bolt will usually measure 5 feet 3.5 inches long, and this is a good length to leave it at. 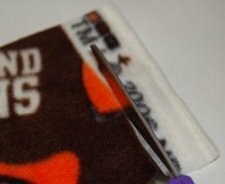 Be sure to trim off the ends of the fleece if necessary, to cut off the white ends (as shown bottom left). 2. Next, on each end, measure 4 inches up from the bottom of the scarf, and mark this with a line of tape, as shown. 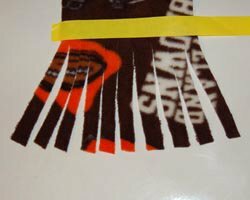 Then, measure off 1/2 inch segments along the bottom of the scarf, and cut 1/2 inch wide strips up the bottom of the tape. 3. Now you can decorate the tassels with pony beads. 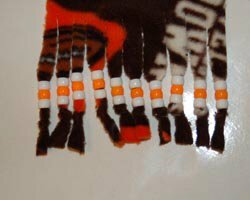 I used three beads per fringe, but you can use as many as you like. 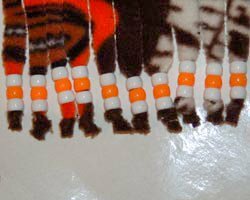 Thread each bead by pushing the corner of the tassel into the bead. It helps if you use tweezers to pull it through the bead. 4. 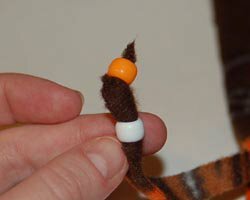 Make a knot after you have the beads threaded on, then you can cut off the excess with the scissors.